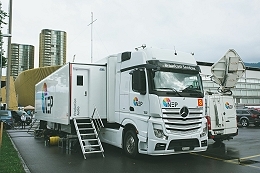 NEP Switzerland purchases second 4K/UHD OB production van. Volketswil, Switzerland, November 2017: NEP Switzerland has begun working with its second 4K/UHD OB Van unit, conceived and delivered by Broadcast Solutions GmbH. The Swiss company doubled its 4K production resources in readiness for broadcast production work on the 2017/2018 season of the Swiss Raiffeisen Super League (RSL). The newly added UHD 42 OB Van is currently in use for producing of the Swiss Premier Football League’s games in 4K/UHD. Like the previous OB Van, UHD 42 is based on Broadcast Solutions’ Streamline Family of OB Vans. UHD 42 is the newest model of the Alphaline model, a variant of the Streamline OB Vans. This Alphaline OB Van offers two production areas and supports up to 10 camera productions, thus making use of more freedom for the customer in choosing room concepts and equipment. After undergoing its maiden voyage producing athletics events, the UHD 42 OB Van is since the start of season 2017/2018 in use for the Swiss Raiffeisen Super League. All in all NEP Switzerland produces more than 140 matches in 4K/UHD during a season – all broadcast at Pay-TV channel Teleclub Sports. In their own words, NEP Switzerland now produces the sharpest league in the world. Thanks to the good experiences and the smooth production with the first 4K/UHD OB Van (UHD 41), also supplied by Broadcast Solutions, it was only a logical step to use an additional 4K OB Van to entirely produce the Swiss league in 4K. UHD 42 is based on the Streamline Family of OB Vans, especially on the Alphaline A16 OB Van model, a variant of the Streamline OB Vans, offering more considerable freedom in choosing equipment and room concepts. The UHD 42 provides up to 23 spacious workplaces and excels with two production areas and large slomo areas as well as additional VIP areas for producers, moderators and guests with additional monitors. The single-expansion full-size trailer offers 4.5 rooms and seven working areas. Reto Osterwalder, managing director at NEP Switzerland, comments on producing in 4K/UHD: "To produce in 4K/UHD – for others still the exception – is a daily business for us. Thanks to the experience we have gained as a team when producing the last season in 4K, our modern new 4K/UHD OB Van and our outstanding infrastructure, we catch the matches’ atmosphere with perfect images and deliver them to the viewers – reliably, every match day." NEP Switzerland’s new UHD 42 is designed as a full-size trailer with a single large extension and can work with up to 10 4K/UHD cameras. NEP Switzerland opted for Grass Valley’s LDX 86N cameras, delivering native 4K signals, together with Canon lenses. As vision mixer, a Grass Valley Karrera K-Frame with 8 M / E is used. Heart of the audio section is a Lawo mc256 console with 48 faders as well as a Lawo Nova73 Compact router. Four EVS XT 4Ks are available for replay, highlights and clips. The OB Van offers two separate production areas. Where the majority of 4K/UHD television productions presently use Square Division (where the full image is divided into four quadrants), UHD 42 uses the Two-Sample Interleave (2SI) format (4x 3G-SDI, pictures in ¼ resolution). The used format offers advantages in handling additional HD signals, simultaneously produced for all matches of the Raiffeisen Super League. For instance, Intercom signals are transported with the HD feeds, since many of the UHD feed channels are already required for the broadcast’s trilingual commentary production.